For Senior Dogs 5 years and older. Use continuously for best results. Old Bones! 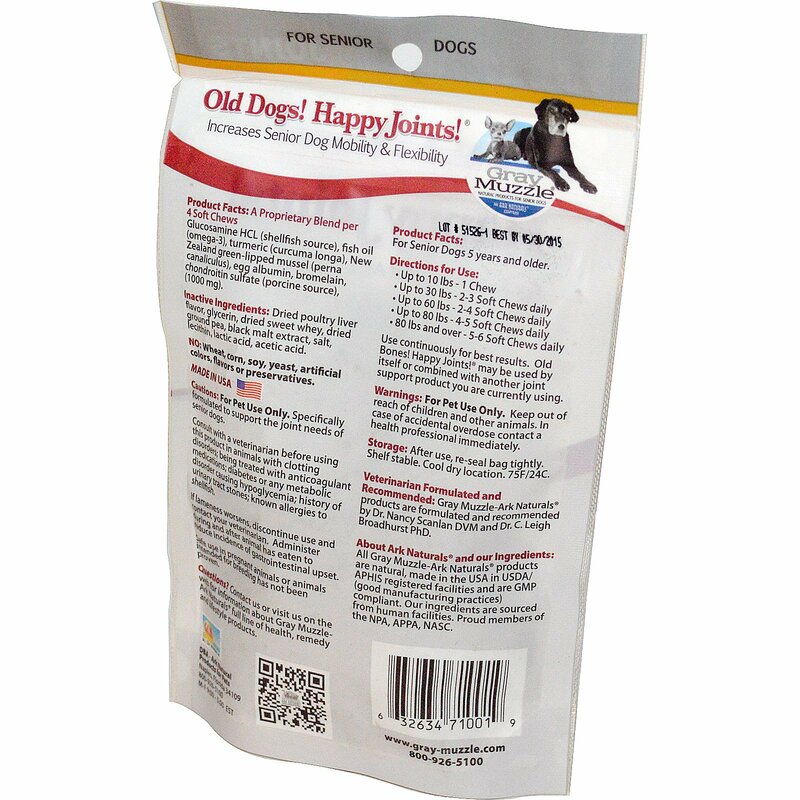 Happy Joints may be used by itself or combined with another joint support product you are currently using. Product Facts: A Proprietary Blend per 4 Soft Chews Glucosamine HCL (shellfish source), fish oil (omega-3), turmeric (curcuma longa), New Zealand green-lipped mussel (perna canaliculus), egg albumin, bromelain, chondroitin sulfate (porcine source), (1000 mg). Inactive Ingredients: Dried poultry liver flavor, glycerin, dried sweet whey, dried ground pea, black malt extract, salt, lecithin, lactic acid, acetic acid. No: Wheat, corn, soy, yeast, artificial colors, flavors or preservatives. All Gray Muzzle-Ark Naturals products are natural, made in the USA in USDA/APHIS registered facilities and are GMP (good manufacturing practices) compliant. Our ingredients are sourced from human facilities. Proud members of the NPA,APPA, NASC. For pet use only. Keep out of reach of children and other animals. In case of accidental overdose contact a health professional immediately. Storage: After use, re-seal bag tightly. Shelf stable. Cool dry location. 75F/24C. Cautions: For pet use only. 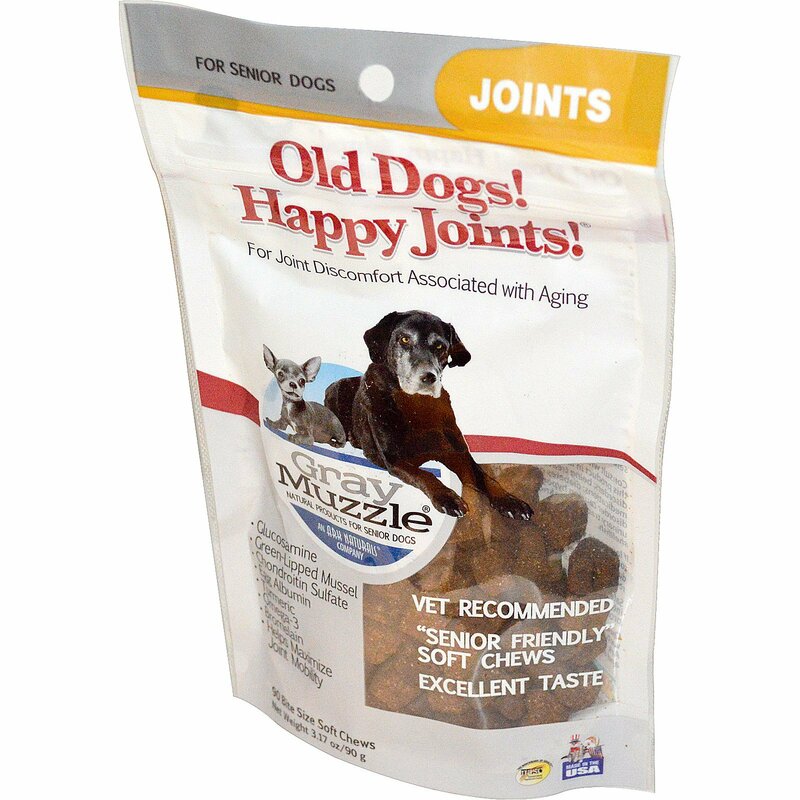 Specifically formulated to support the join needs of senior dogs. Consult with a veterinarian before using this product in animals with clotting disorders; being treated with anticoagulant medications; diabetes or any metabolic disorder causing hypoglycemia; history of urinary tract stones; known allergies to shellfish. If lameness worsens, discontinue use and contact your veterinarian. Administer during and after animal has eaten to reduce incidence of gastrointestinal upset.